What happens if you drive into water and then switch seats to man the turret? Will it sink? Nope it floats unless it gets destroyed. The APC mission even has a funny scene where a cargo bob drops one in the water and it sinks in a huge splash and then pops back up. Sweet, thanks. Too poor to afford the new stuff yet but wanted to know if it would become a boat anchor if used like that. Even if it's not true to the original, regardless it's still a powerful tool to just be able to call one up on the spot, have it appear right near you, and have your enemy face 20K just to destroy it. I feel like it's better and worse, simultaneously, than it's GTA IV namesake. While I would have loved to have control of the cannon while driving, like in the IV version, I feel that the trade-off of having the cannon from IV would gimp it in it's GTA V incarnation. The cannon in the IV version could pump a couple of shots into a stock car and you'd still be able to drive (if I remember it correctly). Conversely, giving the driver control of the cannon in it's current incarnation would probably enter the overpowered territory. I'm okay with the V incarnation, other than a lack of homing option for the launcher. The ability to swap from driver seat to gunner nearly seamlessly makes it still viable for lone wolves. On top of that, i'd say it trumps the Insurgent on account of it being armed but having the same defensive rating and decent speed. Plus, rear-mounter unlimited proximity mine launcher. OP updated, thread name updated. I feel like it needing 2 players doesn't make it any less powerful. It just means someone like me is hardly ever going to be able to use it, while groups of players will have yet another advantage against me. I'll still beat them of course, because I'm a Hunter - but yeah, I think it's lame myself. Really considering to trade something for this...maybe my bodhi....but that still would kinda hurt to be honest, even though the investment into that one was not huge. The power this thing has though....even as solo player having the misile system it can have being called for like a car is pretty f*cking sick. I thinking about trading in my Insurgent for this. Are the missiles also controlled by other players? Why it can't be solo R*? After accidentally buying one (yes, really, I was really tired), I found out the one thing that it truly excels at - as an off-roader. It tears through cliffs almost like it's flat ground. 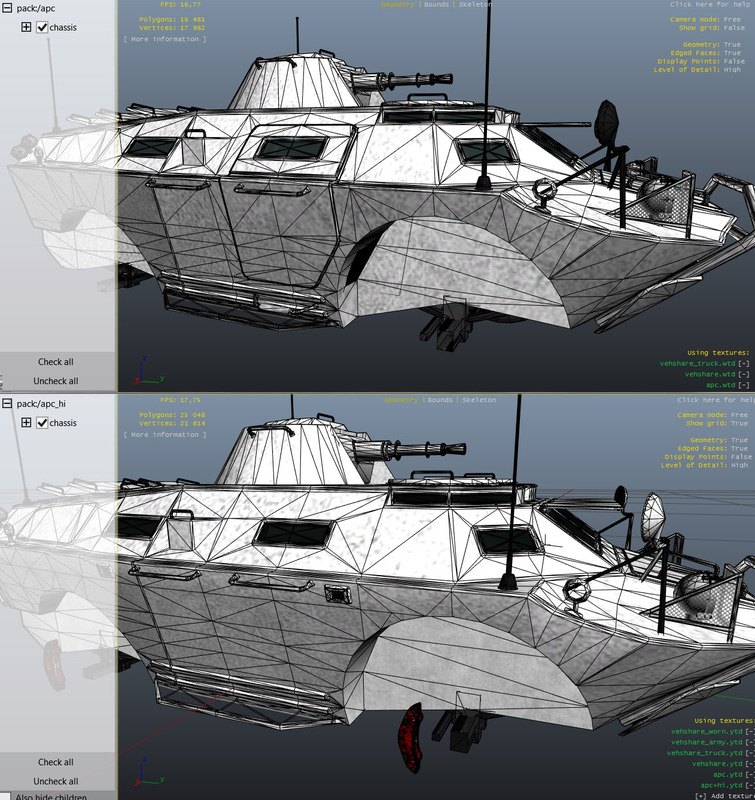 The APC can hitch to the AA Trailer as well. A fun thing to do is get two other players, have one of them summon their Trailer, attach it to the APC, and go nuts. One man drives, one man uses the turret, and the third man can use the AA Trailer for taking out the incoming birdies! I mean it does have a higher poly count. 16k > 25k is a pretty big jump. I would've chose the GTA IV turret or something with splash damage. As it is, the default APC gun is just a Railgun with Rhino effects, kinda bleh. How the HELL is a 3 ton Death Wagon able to float on water? Can it's real life counterpart do that? And if the real life counterpart can do that, how the hell does that float in real life? I much rather have gta4's apc... a cannon that can be controlled by the driver and it it doesn't have "press A to make car go BOOM ! ", but rather a cannon that deforms a car (as far as I can remember)... isn't that way more fun ? Force a player to get out of his smoking-highly-deformated-car and then blow his head off ? This isn't real life. It's a video game. In real life can humans pull red hot miniguns out of their asses? Yes many of the real life variations can float on water. Weight has nothing to do with if something can float. The heaviest boats in the world weigh more than 600,000 tons. It's mostly inspired by the Russian BDRM2, which is also amphibious. There are also plenty of other APCs and even tanks in real life that are amphibious. Amen bro. Any object can float as long as it weighs less than the water it displaces. Should I buy one of these or Wait for the Insurgent Custom. They're nearly the same vehicle. 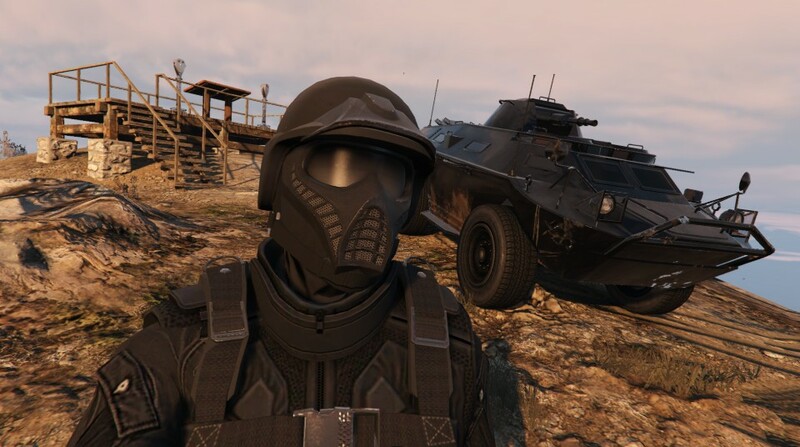 Buy the APC, it's amphibious, great overall armour and the passengers can man machine guns on either side. If you are not driving you can quickly change seats to the turret without having to get out of the vehicle. C'mon guys, is it really so hard to slam on the breaks and press a button. I was 1) surprised the drivers could switch seats without leaving the vehicle, and 2) impressed with how fast i am ultimately able to switch. If you're in the water your fastest way to come to a stop is hold the break/reverse button while tilting the vehicle backwards. With a little practice it's pretty easy to get the hang of. Personally, I'd much rather have this version with a stronker canon but have to switch seats over the underpowered BoGT version..
How does bullet protection compare to the kuaruma? Is it hand guns only/no throwables from the inside? If it's a PV it can be sold, yes? Does that mean it can enter LSC? Can non 'research' mods be done at LSC? Engine, brakes, colors, etc? It can be sold, it cannot enter LSC, and it can only be modified at the MOC.